Khetsün Zangpo Rinpoche (Tib. མཁས་བཙུན་བཟང་པོ་རིན་པོ་ཆེ་, Wyl. mkhas btsun bzang po rin po che) (1920-2009) was born in Central Tibet in 1920 from a patrilineal descent of ngakpas. He studied the sutras and tantras from 1937 to 1949. After which and until 1955 he mainly practised in closed retreat. In 1959 he fled Tibet for India where he first spent two years on retreat. 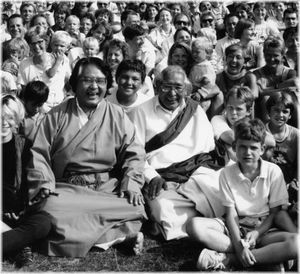 Then he went to Japan to teach for 10 years at the request of Kyabjé Dudjom Rinpoche. Back in India he became in charge of the Library of Tibetan Works and Archives in Dharamsala. He is the author of many volumes of teachings including the outstanding Biographical Dictionary of Tibet and Tibetan Buddhism in 12 vol. Rinpoche lived at his monastery in Sundarijal in the Kathmandu Valley of Nepal, which he established at the request of Kyabjé Dudjom Rinpoché. He passed into parinirvana on 6th December, 2009. He attended the historic gathering at Prapoutel in 1990. The Biographical Dictionary of Tibet and Tibetan Buddhism in 12 vol. Fundamental Mind by Mipam Rinpoche with practical commentary by Khetsun Sangpo Rinpochay, Translated by J. Hopkins, Snow Lion, 2006. This page was last edited on 29 January 2018, at 22:45.